Ruwais, United Arab Emirates (UAE). Average high temperature in July: 47C (117F). Average low temperature in July: 35C (95F). Ruwais was founded in the late 1970’s as a refinery town, replacing a small fishing village. The population is primarily workers brought in from other countries (India, Pakistan, Philipines, etc). These people work 6 or 7 days a week at the refineries and sleep in worker camps, 10-12 men per room. They are paid about the equivalent of $300-500 a month. You can see one of the camps on the top left of the photo. Air pollution in the city is bad, although not as bad as nearby Abu Dhabi, averaging 8 times as much as New York City. 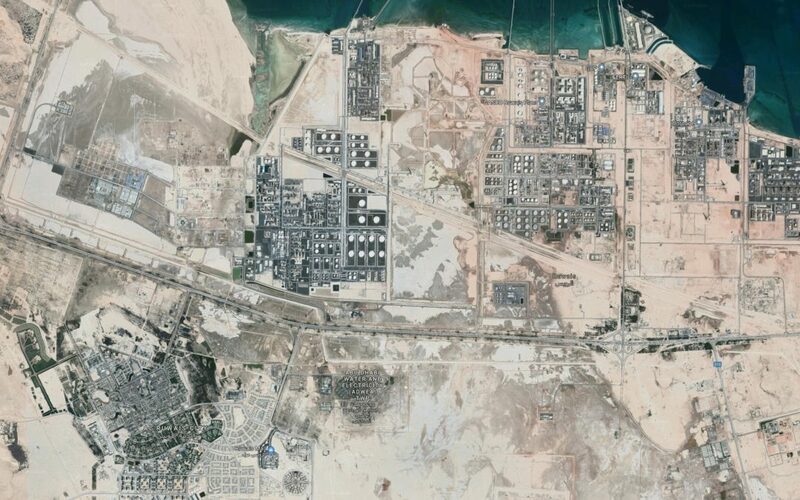 Ruwais is currently home to the world’s fourth largest refinery capacity. UAE is responsible for 6% of global oil production. They are in the process of developing the world’s largest integrated refining and petrochemicals facility, including a new 600,000 barrels per day refinery in Ruwais, which will then make the refineries in Ruwais the world’s largest capacity. Note that in order to stay below 2C global warming we must be using zero fossil fuels and emitting zero CO2 by 2050. Image from Google. Data sources: Carbon Ideologies by William T. Vollmann, Wikipedia, The National.